I don’t consider myself to be a ‘foodie’ by any stretch of the imagination. Food, in my opinion, is functional. I don’t usually take much enjoyment in thinking about or preparing food on the whole. So it comes as a bit of surprise that I found so much enjoyment in it while I was in Morocco. After a hard days work in the sweltering (sometimes 40+ degree heat) food is all of a sudden very important. We were not disappointed with what we ate! 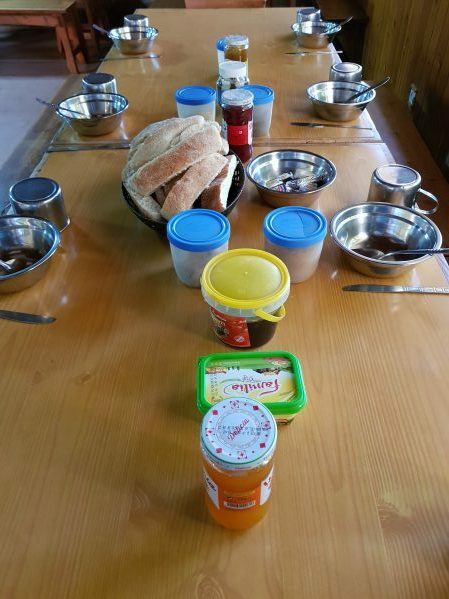 Breakfast was usually a simple affair, comprising of bread with a variety of jams, chocolate spread, soft cheese and coffee. 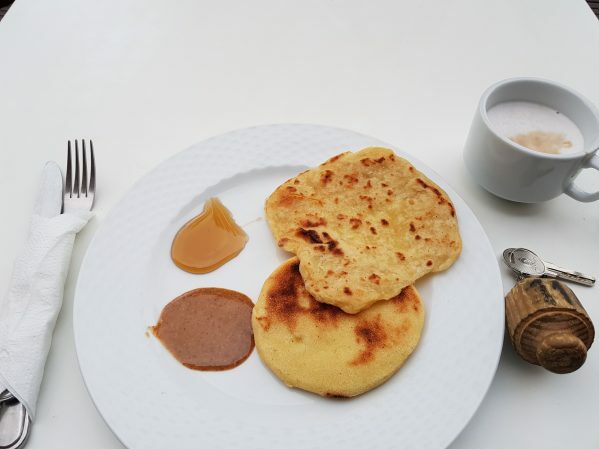 Or if we were lucky we got a mixture of Moroccan pancakes and crumpets with honey. 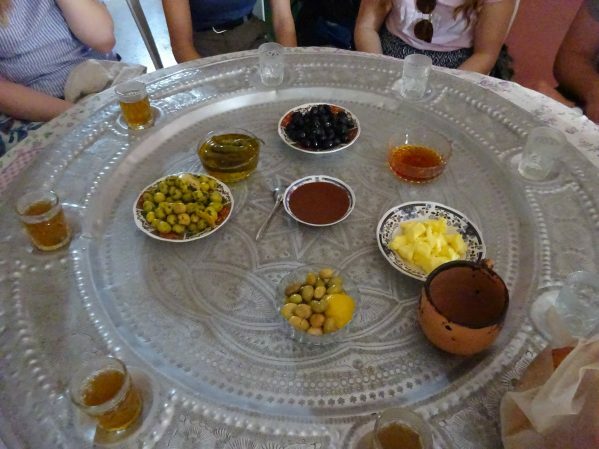 Breakfast number 2 was more of a social occasion and consisted of more bread, olive oil, olives, amlou (a mix of argan oil, honey and almonds) and honey. Each person rips a piece of bread off the loaf and dips it in the different liquids. 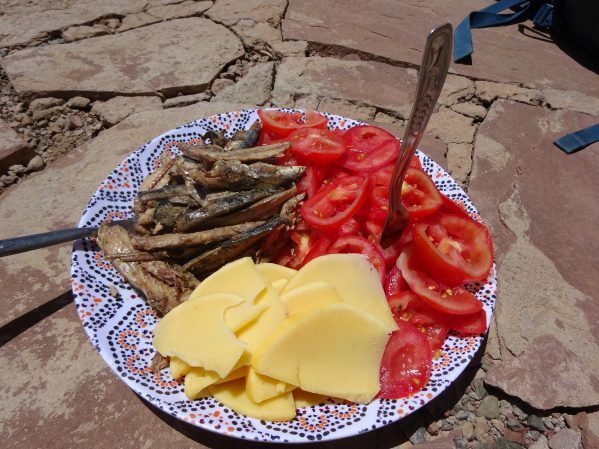 Lunch was the best meal of the day for me as it was fresh salad, sardines, (more) bread, followed by melon, watermelon, or oranges. There was usually couscous or rice to go with it too. 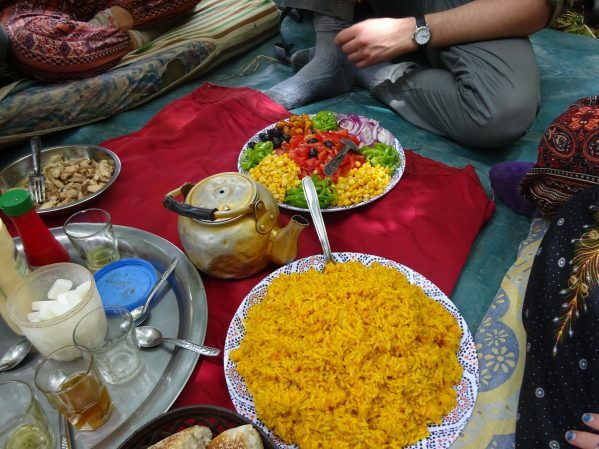 The freshness of these foods made them taste nothing like the food that we get back home. I can honestly say that the fruit in Morocco is the tastiest fruit I’ve ever had. 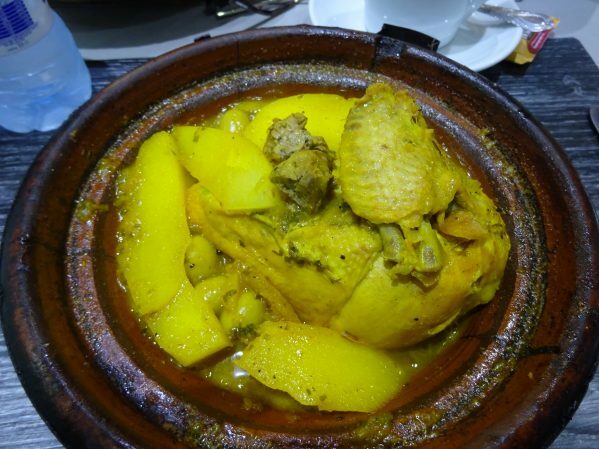 Obviously the best dinner to have in Morocco is a tagine. The tagine is the pot that the food is cooked in and it sits on the charcoal traditionally to be cooked. There are a variety of types of tagine to try. My favourite was lemon chicken or goat. No Moroccan meal would be complete however, without the traditional mint tea. 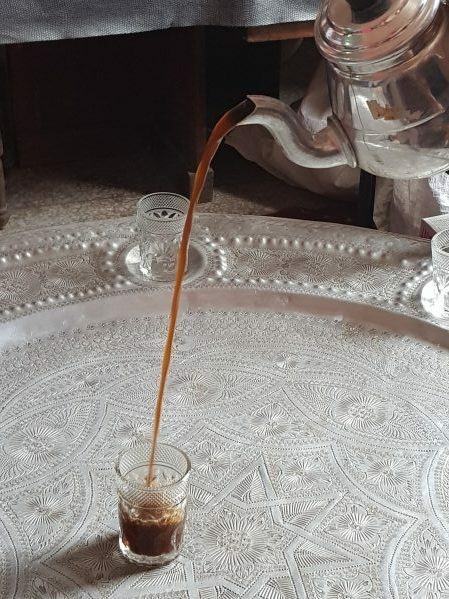 This comes loaded with sugar (although the diabetes conscious Moroccans are trying to stop that tradition) and served from a silver teapot into a small glass. I don’t normally drink tea of any description at home but the Moroccan mint tea, poured from a great height, is a treat not to be missed. In the intense heat, the mint tea seems to be the only drink that will quench a thirst! Oh dear! That is hard to bear. I am on day 2 of my resumed long walk and putting up with the bog standard English pub menu. I am hoping for an odd exception as I progress. It’s amazing what we eat outside that we would not at home!